The Char-Broil Big Easy is our pick for the best turkey fryer, which uses an oil-less way of cooking, which is the TRU-Infrared cooking technology. It easily roasts up to 16 pounds of turkey or any kind of game or fowl and comes with various accessories such as a meat thermometer. It runs on simple propane as fuel. Our step-up pick is the Butterball MB23010618 XL and this one runs on electricity, and is very easy to clean in the dishwasher for most of its parts. It comes with a magnetic breakaway cord as a safety feature and has drain clips made for the aluminum basket for ease of use. The budget pick is the Masterbuilt 20100809 and it can handle turkeys up to 18 pounds and in an oil-free manner as well due to the removable drip pan that is at the bottom of the unit. It can cook any fowl in an efficient way thanks to the 1,650-watt electric element inside the unit. The turkey is mostly roasted rather than fried. Turkey is a common game or fowl, and food item that is mostly served in Thanksgiving parties. The turkey has been a long time tradition for Americans, but it is also enjoyed in some countries as a good fowl dish with many recipe variations all over the world. Much like chicken, turkey is a healthy source of protein and energy, as compared to other types of meat, because both of them are sources of white meat. Fryers can be a source of too much oil and fat if they are not oil-free. Frying something can lead to frustration if you are on a diet. This is because if you go on certain diets that require you not to eat too much greasy foods, it can be hard if you have to fry your stuff all the time. This is why many people have tried efforts to make their food less greasy so that they can have a healthier diet and lifestyle, which can help improve their well-being and potentially live longer. Most heart problems are caused by excessive fats and oils. Many people get heart problems due to excessively greasy foods, so it’s better to cut down on it. This is why many kitchen appliances nowadays have better ways of preventing too much grease from sticking onto your food items. For example, many grills out there have a grease tray to catch the grease and keep it away from your food items. The same is true for fryers out there – which may have mechanisms to keep away grease. A turkey fryer will usually be like a big casserole with a tall height, much like a taller version of a rice cooker or pressure cooker and about as tall as two stacked pots together. This is because turkeys can be really large in size depending on what game you caught for Thanksgiving or for any occasion whatsoever. This kind of frying unit can vary in terms of features and size, but most of them nowadays will be oil-free. To have something that is oil-free means that it will most likely use electricity to run, hence making it easier for you to cut down on the grease. Most of these cooking units or frying units will use a kind of infrared called TRU infrared cooking technology. This is kind of like an indirect heat source to help cook your item and fry anything, from chickens to turkeys to any game or fowl. While it is true that those frying units that use TRU infrared cooking technology can mostly run on electricity, there are budget ones that are designed to run on propane, which is more economical overall. It might not be as safe as electricity when not monitored properly, but it will be more familiar for people who have been using propane as a form of fuel for cooking, anyway. Fuel used: the fuel for this kind of frying unit can be either propane or electricity. Propane is a good choice for those who want a frying unit that is ideal for business purposes or for restaurant use, while electricity powered frying units are ideal for most cases when they need to focus more on safety, such as with being in a closed area. Way of cooking: most of these frying units will use TRU infrared cooking technology to heat up their food items and cook them, making most of them an oil-less system. This way of cooking is healthier than other systems out there, or as compared to the traditional one, because it helps you to not get too much grease and oil in your body when you consume foods for Thanksgiving or parties. Durability of parts or construction: you also have to consider a durable frying unit so that it will last for the many years to come, especially if you are running a restaurant, an eatery or a business that involves frying chicken and other game fowls. Stainless steel parts are a must-have, but they should be of high grade if you want them to last longer, as not all stainless steel could be corrosion-resistant as much as the other. Size of the unit and the capacity: this is usually measured in pounds depending on how heavy your game or fowl is. The capacity and size of the unit is important so that you will know if it will fit your kitchen space or not. The capacity will help determine if your game or fowl will most likely fit into the frying unit, so you may want to get a bigger one if the fowl that you often catch are usually bigger in size. Heating power (if gas or propane): the frying unit can be measured in BTUs if it runs on propane or gas. This is the measurement of heating power, which is crucial when it comes down to how fast the frying unit can easily cook your food items. A higher BTU rating for the frying unit means that it can potentially cook faster than other units out there. Wattage (if electric): if your frying unit is electric powered, it should have a displayed wattage for the energy consumption, which is helpful if you want to monitor your monthly electric bill properly. A higher wattage can also mean it will cook faster and will save a lot of time in the long run. Safety features: you can also count on a frying unit that has more safety features than the rest. This assures that you will not get possible burns and injuries when you are handling the frying unit and taking out the turkey or fowl in it. Ease of cleaning up: a great thing to consider for a frying unit would be something that is easy to clean up. We all know that most kitchen appliances that use electricity can be hard to clean up, and so you need something that will only take a few wipes due to its nonstick nature, or its design as a whole. This is important if you want to save more time cleaning and spend more time with other important things. The Char-Broil Big Easy is our top pick for the best turkey fryer. It is very easy to use and will leave you guilt-free and oil-free in cooking, because of its TRU-Infrared cooking technology, as you will not get hot and cold spots at all in the unit itself when you cook your favorite fowl or dish. It is also a propane powered unit at 16,000 BTUs of heating capability, so that you can cook up items in a breeze. This frying unit can take up to 16 pounds so you can process most game or fowl easily than other units. Because it is a healthier way to cook without oil, many people will find this useful if they are on a diet, with no extra calories but still juicy as a result when you cook food here. It can be able to fry whole turkeys and even make turkey breast delicious even without the guilt of oil and fats. It is a speedy unit that cooks within 8 to 10 minutes per pound for better efficiency for any chicken and game recipe that you have in mind. It can also cook a lot on a single tank of propane so it is also a fuel saving unit in the long run. Included in the package is the cooking basket that looks durable. 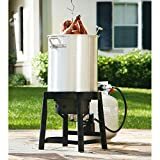 This turkey fryer is also ideal for ribs beef and pork tenderloin and various other meat recipes due to the inclusion of a meat thermometer, which can help you with large cuts of meat. The Char-Broil Big Easy comes with a quick start cooking guide. Like most propane cookers, it needs to be seasoned before using. It can give you a crispy exterior for the bird, game or fowl recipe you have in mind. While not a deal breaker, the Char-Broil Big Easy might have fewer instructions in the manual, but you can easily search such starting tips online, anyway. The Butterball MB23010618 XL is our step-up pick, in which the safety feature is the magnetic breakaway cord. Like our top pick, it is also less in oil, as it uses 1/3 less oil than regular frying units out there to assure a healthier lifestyle. It is great for commercial use due to the durability of the product, as well as the great features found on it. You can be able to use it for chicken wings as well. In this frying unit, there are drain clips are included with the aluminum basket for ease of use. The unit is currently available in large and XL sizes and it can take up to 20 lbs of turkey in one go. Because it is electric powered, it does not use gas or anything that might be potentially dangerous to closed spaces. It can also help you to bake potato recipes easily. This unit is also easy to clean due to the dishwasher safe components. 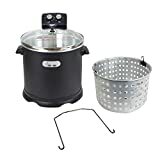 You can prepare hot tamale and even seafood dishes with this turkey fryer, which provides easy clean-up due to the drain valve for the oil and doesn’t make any mess at all. It is also ideal for steaming vegetables and comes in a complete package, which includes the basket drain valve, lid and pot. As our budget pick, the Masterbuilt 20100809 is powered by a 1,650-watt electric element, making it an electric powered unit to fry your chicken or turkey on. It can take up to 18 pounds of game or fowl with its capacity and it has a tempered glass lid for ensuring security and heat retention all throughout the cooking process. Because of its oil-free design, it will be much healthier to cook on, as compared to traditional units out there. It also has a lid clip to ensure that the food is safely kept inside and to avoid the escape of heat. If you also like smoking, you can use the included wood chip box for a smokehouse flavor for all of your meat products and meat recipes. It also has a removable drip pan for ensuring that less grease will get into your food. 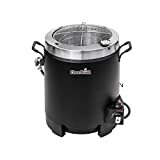 With its double-wall construction, this turkey fryer and roaster is quite durable and can last for many uses, especially for commercial purposes. It has an easy to use dial analog control and it is backed by a 90-day limited warranty. If you want something that uses propane as fuel, the Masterbuilt 20020107 Propane can be a good choice. It has a cast iron burner that is durable for many years to come and easy to maintain. It also has an aluminum pot that is not going to get corrosion too soon with proper usage and cleaning up. It is also equipped with the needed LP gas cooker stand, which has a good design and does not make the top pot topple over to avoid accidents. It can also keep consistent oil temperatures due to the lid design. It comes with the needed type 1 regulator hose for the unit. This fryer also comes with an electronic timer to make it easier to monitor what you are cooking at the moment. It also has lifting hook that has wire for handling to make it easy to handle. There is a auto shut-off for the timer to prevent instances of overheating and the like. The pot can take up to 30 quarts (18 pounds) of fowl or game and even includes a stainless steel thermometer for accurate measurement of food temperature. If you want a unit that comes with a food thermometer, the Member’s Mark can be a good choice. A food thermometer, specifically one for meat, is important because it can help you determine whether the food item is already done or not yet. It can also be used to steam veggies so it is a multipurpose cooker in one go. It also has a safety timer so that your food items will be safe from burning and overheating. It is also great for other things other than frying turkey, such as seafood, which can be served at parties. The included aluminum pot is at 36 quarts in capacity so you can be able to fit various items in there for boiling, frying or steaming. What’s more, you are assured of safety in terms of the fuel regulator because it has a CSA approved design for its included valve hose regulator at 5 PSIG. Great for outdoor picnics and camping sprees, this can also help you to cook various fish and meat recipes. It has a welded stand that is durable and stable. With its included 15 inch thermometer and strainer basket, your outdoor cooking experience can be aided well. If you want a turkey fryer that has a nonstick interior, the Waring Pro TF200B is a good choice. The nonstick interior can help you to clean up this unit much easily so that you can have more time to do other things as well. It also uses 1/3 less oil so that you can have less oil and fats in your body when you consume your food items and recipes. It can cook up to an 18-pound turkey due to the ample amount of space inside. It is also pretty fast at cooking, as it can cook about 3.5 minutes per pound of turkey or chicken. It also has a thermometer to help you measure the food temperature properly. Equipped with a rotisserie function, it is definitely a must-have for cooking fowl and game with its 1800-watt heating element. This unit also has indicator lights to let you know when it is working. Its stainless steel reservoir which has 2.5 gallons of capacity is also pretty good for the unit’s design. It comes with a drain valve with hose for its system and has a sturdy, stainless steel base, which cannot be easily toppled down. You can use it for cooking chicken wings as well and it has a 5-year manufacturer’s warranty. If you want a frying unit that uses electricity for cooking and heating, the Chard EDF-15 Electric can be a good choice. At 1,700 watts, it is quite powerful and heats up quickly as compared to other electric units out there. It is also ETL certified for safety purposes as a kitchen appliance. Because it has an aluminum fryer pot, it will be easier to carry around but still stable and less likely to get corrosion. It also has an auto shut-off feature that goes along with its many safety features. Because it has a glass cover, you can easily see your food being cooked and know when it is properly done. Nonetheless, it also has a 90-minute timer to prevent burning accidents in the kitchen. It also has a safety handle with a twist and lock option to keep your unit and food safe, especially for outdoor cooking. It also has a magnetic breakaway power cord as an additional safety feature. It is perfect for most meat processing activities you need to do indoors and outdoors. It has up to 16 quarts in its pot in terms of capacity. Because the heating element can be disassembled, cleaning up this unit is quite a breeze. 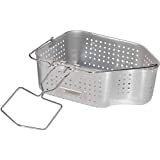 Also, the strainer basket is simple enough to take out and clean separately. Because of its variable temperature control, you can set the right temperature for your specific recipes. The BestMassage Turkey Fryer is a good choice if you want something that is portable enough to be taken to camping grounds. This propane turkey fryer can provide a constant temperature for your food items and for cooking poultry due the lid being properly sealed and fitting just right. It has a 30-quart aluminum pot so it can fit a lot of items there. The design is just right for most outdoor cooking activities due to the durable metal frame. The included meat thermometer measures 12 inches for you to measure the food temperature in a precise way. It also has a CSA certified adjustable regulator as well as a lifting hook for safely. This unit can produce up to 54,000 BTUs heat output, which is important for faster cooking and heating times to get your chicken or poultry done in a breeze. For those with large turkeys to process, you can consider the GRAND GOBBLER, which has been made with aluminum materials at 16-gauge. It has a hook and rack for poultry and has a pot that measures 42 quarts in total. It has a 12-inch thermometer for you to measure the temperature, with a range of 50 degrees to 750 degrees Fahrenheit. There is also a seasoning injection to help you with certain poultry in mind. It has a stainless steel burner that is sturdy and not easy to topple over. The lid is vented to maintain a good temperature and texture to whatever you cook inside. A free insulated glove also comes with the unit to prevent accidental burns when handling the turkey or poultry recipe. This Cajun Injector Gas has an aluminum pot that is quite durable without putting too much weight. It has a specifically designed stand that will not easily fall down due to the triple balance. It has a 30 quart aluminum pot that can fit many food items, from poultry to veggies. There is a temperature gauge included at 12 inches in length. It has a heating power of up to 41,000 BTUs, which is pretty powerful for quick cooking. Its hose system is also CSA Certified for safety, along with the included 1 regulator and hose which is a UL Listed component. There is also an automatic shut off feature with its timer for preventing burning accidents indoors and outdoors in any kitchen or food preparation area. There were others that did not make it to our list because they were too small to be ideal for turkey and game. It is also important to have safety features and ease of cleaning up so that you will not have trouble in the kitchen when preparing your fried fowl. It is also important to have less grease for healthier cooking, but other contenders did not have this feature. Q: What makes a turkey fryer stand out from the competition? One of the most served birds during Thanksgiving. Oil draining system This kind of system helps to easily drain oil when it is no longer needed. This helps to save time and effort in terms of cleanup. Durability The materials that are used to making the fryer can matter in terms of durability. For instance, stainless steel is a must-have if you want to keep it running for years to come. Temperature control This is helpful when it comes down to moving from one recipe to the next. Not all food items will require the same kind of heat – different heating temperatures may be required by different food recipes. 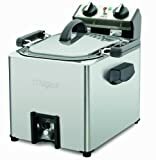 Not just for turkeys If you want a fryer that is for all around work in the kitchen then you should get one that can fit many items at one and can also be used on vegetables and other meat products as well. Good size The size or capacity should be just enough on what size of poultry you intend to cook with the fryer. It should also reasonably fit into your kitchen countertop and should be easy to store. Comes with different accessories Most of these fryers can come with various accessories such as a food temperature and other things that can help you cook your poultry. Q: Should I use a fryer indoors or outdoors? Sometimes, you need to be careful with your fryer when you cook outdoors. A: Whether your fryer is for indoor or outdoor use, you should consult the user’s manual to make sure if it is okay for indoor or outdoor use. This is because there are fryers that are only ideal for indoors and some are only ideal for outdoors. However, some can be used for both, which can be a great unit to have overall. Q: Can you use a roaster oven to cook turkey? Turkey roasting in an oven. Q: Which places should be kept away from an outdoor fryer? Q: What are some dangers of frying with vegetable oils? Certain cooking oils can have too much fat content. Artificial processing Most vegetable oils have been artificially processed, as compared to coconut oil and olive oil, which are both natural and mostly organic. Omega 3 and 6 ratio We’re consuming too much omega-6 as compared to omega-3 fatty acids, which is bad for the body in terms of health balance. More likelihood of inflammation Omega-6, when taken in excess, leads to more inflammation. Omega-6 is greatly present in vegetable oils. Trans fats Don’t think that this whole “trans fat” thing is just a fad – trans fat has been proven to cause risks for cancer, obesity, diabetes and heart problems. Q: Can you steam turkey? A: While it is possible to steam this kind of poultry, it is not commonly done as compared to chicken. However, you can definitely make it at home and it will most likely be similar to chicken that is steamed. Recipes you can try include dumplings, in which you can wrap the poultry in a dumpling wrapper to create a delicious steamed dish. Q: Which methods of cooking use no oil at all? Methods like sauteing use less oil. Q: How can I make turkey meatballs? Form half inch cubes of mozzarella, then chop the basil and onion. Prepare ground turkey in a bowl and add the spices, such as onion, oats, egg and tomato puree. Mix them all together. Put some oil in a nonstick frying pan and heat it up. Take your ground turkey mix and form balls while putting the mozzarella cubes. Fry it on the frying pan until brown on all sides. Place the meatballs the oven up to 15 minutes with a preheat temperature of 350 degrees. Q: Is it possible to make a tacos recipe using turkey? A: Yes, like most poultry, you can definitely use turkey for a tacos recipe. This recipe can be easily done using a slow cooker or even in a simple stove setting. If you are into Mexican food then you can definitely try this recipe for a twist, since poultry is healthy and a source of white meat. Q: What are some unconventional food items that I can deep-fry in a fryer? Q: What can I do with leftover turkey? A: If you have leftovers of this kind of poultry, you can easily make salad using its thin slices and bits, combining it with vegetables. Salad that has white meat from poultry is definitely a healthy choice and what’s more, you can easily take care of the leftovers in this way. Q: Which oils are ideal for frying turkey? Oil from peanuts isn’t as flammable as other oils for frying. Peanut oil It is not as flammable as other types of oils, making it the safest to use for this kind of poultry. It can be expensive, however. Corn oil Like peanut oil, it also does not catch fire or smoke too easily, making it safe to cook with. Avocado oil This is another good choice for a cooking oil that does not easily flare up. Olive oil (light) and soybean oil Both oils are also great choice for a less flammable type of oil for cooking. Q: Is smoking turkey better than frying or roasting? Smoky flavor The best advantage of smoking would be the smoky flavor, which cannot be achieved by frying or roasting. Retains more nutrients Many people agree that smoking can potentially retain more nutrients in the food item as compared to roasting or frying. No turning needed Turning your food is only applicable if you are using direct heat. Smoking is indirect heat, so you don’t need to turn your poultry or meat product when cooking it when smoking. Food preservation A good advantage of smoking over roasting and frying is the fact that it can potentially help you preserve food items, especially if your goal is to preserve that chicken or poultry for Thanksgiving or Christmas eve. Q: Is it possible to cook turkey in griddles? A: Yes! Aside from frying, you can also roast your favorite poultry in griddles, which can be more applicable for indoor settings like apartments, dorms and condo units. A good recipe for this kind of poultry would be meatballs, which can be combined with vegetables and other ingredients that you may prefer to have. Q: Can wild turkey be a camping recipe? A: Many countries in the world, such as the United States, have a lot of turkey in their wilderness that can be hunted as game for consumption. It also teaches youngsters on how to survive in the wild by hunting game. Another possible reason is that poultry is rich in protein, which can give a person energy to withstand heat and tiredness from camping and hiking. Q: With that said, what do I need to cook turkey when camping? Cooking while camping is a fun activity. 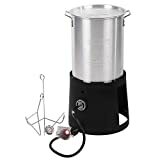 A backpacking stove Backpacking stoves are not really like the fryer at home, but they can provide you with mostly ample heating power and convenience in order to cook your favorite poultry meals. They are also a lot healthier than fryers at home because most of them use less grease or oil. A heat output of at least 65,000 BTUs This kind of heat output is pretty powerful if you are going outdoors. This is because heating outdoors can be troublesome with the wind and rain conditions potentially being a fork in the road. Therefore, you should consider a powerful heating output for quicker cooking to save time as well. Enough space for the poultry Make sure that whatever backpacking stove you have, it should have a pot or container that has sufficient area for the poultry in question. Q: What is the ideal temperature of meat products when cooking in a fryer? Some meat recipes require a specific temperature. Q: What are some common fryer problems you can encounter? Smoking oil Turn it off so that the oil will easily cool down. This is indicated by a temperature that is too hot. Oil catching fire Use a baking tray or a lid to put out the flames quickly after you have turned off the fryer. Don’t use water – it will only spread the fire even more. Fire keeps spreading If things get worse and nothing can put off the fire, call your local fire department ASAP or grab your fire extinguisher, if you have one. Q: How do I prevent oil from catching fire or smoking? Stick to a ratio of 1/3 of oil for the container. Don’t heat the pan or fryer too much. Change your pan or fryer – it may be defective. Dry your food first to avoid splashes that cause smoke. Q: What is the ideal weight for this bird or poultry in terms of frying? A: For frying, a recommended weight for this bird or poultry would be somewhere between 10 to 12 lbs. This is because if it is too heavy, it can be harder to cook or to fry overall. Therefore, you should stick to one with a good weight. Overall, the Char-Broil Big Easy is our pick for the best turkey fryer due to the TRU-Infrared cooking technology for oil-less cooking, accommodation of up to 16 pounds of turkey and the various accessories that are included. Because it is a propane powered or fueled turkey fryer, it can be useful for saving up on electricity and for commercial purposes as well.